The global market for liquid packaging is expected to witness a high growth in the next few years, thanks to the development of the food and beverages industry. In addition to this, the enhancements in the transportation sector is another major factor that is predicted to enhance the growth of the global liquid packaging market in the coming years. In addition to this, the rising focus of players on innovations and developments is likely to support the growth of the market in the near future. Thanks to these factors, the global liquid packaging market is expected to register a promising growth rate in the near future. The increasing focus of the key players on innovations and technological advancements is considered as one of the major factors projected to encourage the growth of the global liquid packaging market in the next few years. The rising number of brands with attractive presentation is likely to support the market growth in the near future. In addition to this, the rising emphasis on personalization is estimated to enhance the growth of the market and offer potential growth opportunities for the market players in the coming few years. On the flip side, the introduction of several substitutes, such as bio-based polymers and the rising carbon footprint is estimated to hamper the growth of the overall market in the near future. Nonetheless, the rising demand from several developing nations and the cost-effectiveness offered by liquid packaging are estimated to augment the growth of the global liquid packaging market in the next few years. The global market for liquid packaging has been classified on the basis of geography into Latin America, North America, Europe, Asia Pacific, and the Middle East and Africa. Among these, Asia Pacific is projected to hold a key share of the market and maintain its dominance in the coming years. The strong growth of this region can be attributed to the rapid development of the pharmaceutical and food and beverage industries. In addition to this, the favorable government policies and the shift of the manufacturing facilities by the leading players, owing to the low operating costs and labor. Europe is projected to stand on the second position, further followed by North America. These two regions are estimated to witness moderate growth in the coming few years. The global liquid packaging market is extremely competitive in nature with a huge number of players operating in it. The rising focus of these players on the development of new products and innovations, which is expected to support the growth of the market in the next few years. Moreover, the rising collaborations and mergers and acquisitions is predicted to enhance the market growth in the near future. Some of the key players operating in the liquid packaging market across the globe are Mondi PLC., Klabin Paper, Tetra Laval International S.A., Nippon Paper Industries Co., Ltd., The DOW Chemical Company, Liqui-Box Corporation, BillerudKorsnäs AB, International Paper Company, Comar LLC, Evergreen Packaging Inc., and Smurfit Kappa Group. This report analyzes and forecasts the market for liquid packaging at the global and regional level. The market has been forecast based on revenue (US$ Mn) and volume (Billion Units) from 2017 to 2025. The study includes drivers and restraints of the global liquid packaging market. It also covers the impact of these drivers and restraints on demand for liquid packaging during the forecast period. The report also highlights opportunities in the liquid packaging market at the global and regional level. The report comprises a detailed value chain analysis, which provides a comprehensive view of the global liquid packaging market. The Porter’s Five Forces model for the liquid packaging market has also been included to help understand the competitive landscape in the market. The study encompasses market attractiveness analysis, wherein end-use industries are benchmarked, based on their market size, growth rate, and general attractiveness. The study provides a decisive view of the global liquid packaging market by segmenting it in terms of packaging type, raw material, technique, and end-use industries. These segments have been analyzed based on present and future trends. Regional segmentation includes the current and forecast demand for liquid packaging in North America, Europe, Asia Pacific, Latin America, and Middle East & Africa. The report also covers the demand for individual packaging type, raw material, technique, and end-use industries in all the regions. The study includes profiles of major companies operating in the global liquid packaging market. Key players in the liquid packaging market include Tetra Laval International S.A., Comar LLC, Evergreen Packaging Inc., Liqui-Box Corporation, BillerudKorsnäs AB, International Paper Company, Klabin S.A., Nippon Paper Industries Co., Ltd., Smurfit Kappa Group, The DOW Chemical Company, and Mondi PLC. Market players have been profiled in terms of attributes such as company overview, overall revenue, business strategies, and recent developments. The report provides the estimated market size of liquid packaging for 2016 and forecast for the next eight years. The global market size of liquid packaging has been provided in terms of revenue and volume. 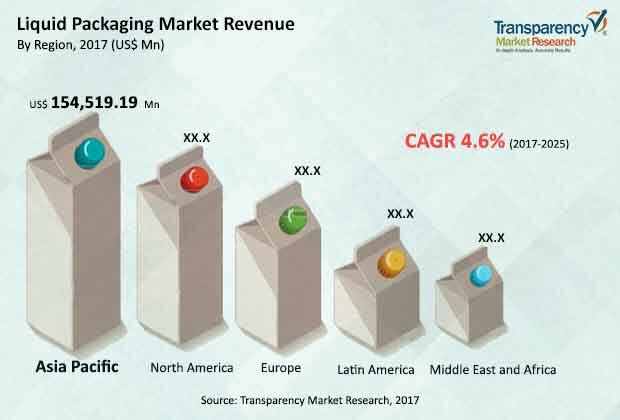 Market numbers have been estimated based on packaging type, raw material, technique and end-use industries segments of liquid packaging market. Market size and forecast for each major packaging type, raw material, technique, and end-use industries have been provided in terms of global and regional markets. Porters’ Five Forces highlights the efficacy of buyers and suppliers and enable stakeholders to make profit-oriented business decisions. Pricing Analysis with respect to packaging type. Global, level analysis for production output coupled with Import/Export trends to better understand the supply-demand scenario.